The scientific name for a calla lily is Zantedeschia. The calla lily is a herbaceous perennial plant, which means that it dies back in the winter. 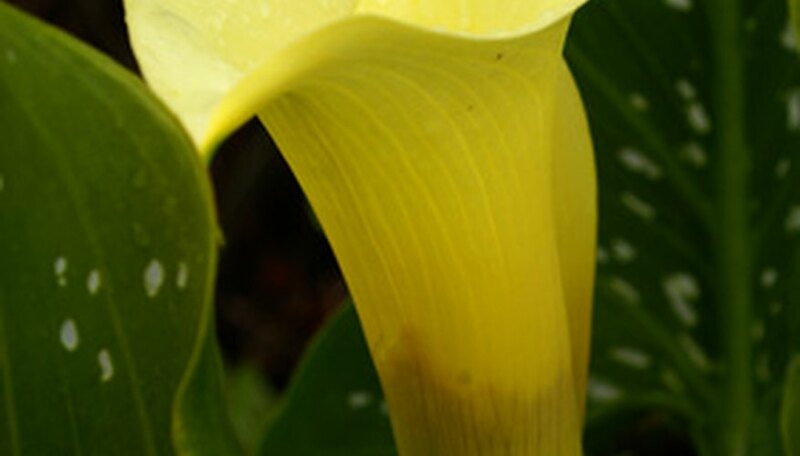 You can recognize a calla lily by its thick dark green stem and trumpet-shaped flower. Calla lily flowers are commonly seen in white, pink and yellow, but can be purple and green. Although calla lilies are grown in hardiness zones 7 through 10, you can grow a calla lily in a pot indoors no matter where you live. Choose a 12-inch flower pot to keep your calla lilies in. According to White Flower Farm, you can place up to three calla lily bulbs in a 12-inch pot. Plant your calla lily bulb in a potting mix that is sopping wet with warm water. The type of potting mix you use isn't important because calla lilies thrive in all soil types. They do need constant moisture, however, unlike most plants. It is best to keep the soil wet at all times. Place a saucer filled with water under your flower pot (the flower pot must have holes in the bottom). This will keep the calla lily with a continuous supply of water. Of course, you will need to water the pot from the top to keep it moist as well. Set your potted calla lily in a spot that gets full sun. The calla lily can also tolerate partial shade, but a windowsill is ideal for this type of plant. Fertilize your calla lily plant once per month with a 5-10-10 fertilizer. This will give the calla lily extra nutrients to keep it healthy so you can enjoy the full bloom of its flower. Place a thin layer of mulch on the soil around the calla lily. This will help the calla lily retain moisture, and will keep the roots warmer during winter months. You can take your potted calla lily outside if the temperatures are above 60 degrees F.
Calla lilies contain calcium oxalate, which is poisonous. It can cause irritation of the throat, diarrhea and vomiting.